Bertrand Russell, the philosophical father of Bernie Sanders? Together with his political and social views with his shock of white hair Bertrand Russell could easily pass for the philosophical father of Bernie Sanders. Many political cartoons of Russell and his views exist, but no Saturday Night Live skits. Of course, Bernie and his antics are far more successful in gaining office and the public’s attention, but many of Russell’s views are reflected in positions that Bernie has taken. 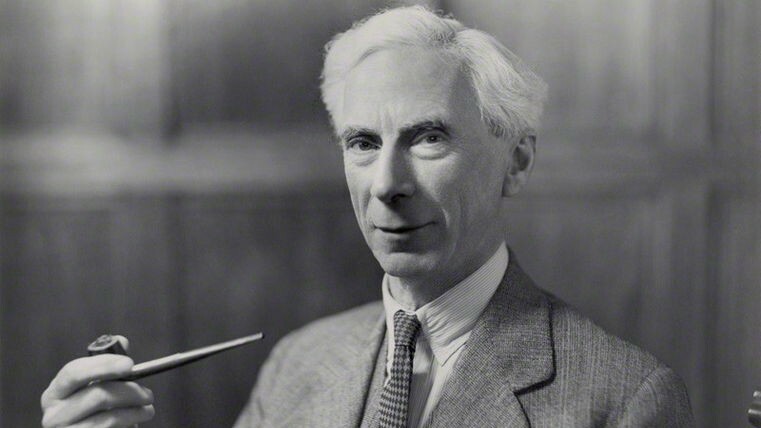 As a young man, Bertrand Russell was a member of the Liberal Party and wrote in favor of women’s suffrage. In his 1910 pamphlet, Anti-Suffragist Anxieties, Russell wrote that some men opposed suffrage because they “fear that their liberty to act in ways that are injurious to women will be curtailed.” In May 1907, Russell stood for Parliament as a woman’s suffrage candidate in Wimbledon. During Sanders long political career he has consistently co-sponsored and voted for pro-women’s health legislation, programs to help victims of domestic violence as well as pushing for equal pay for women. Russell was also an active supporter of the Homosexual Law Reform Society, being one of the signatories of A.E. Dyson’s 1958 letter to The Times calling for a change in the law regarding male homosexual practices, which were partly legalized in 1967, when Russell was still alive. Likewise, Sanders has demonstrated his support for this community for decades. As early as 1983 when he endorsed the Gay Pride parade in a time when it really wasn’t popular to do so. Bernie also co-sponsored of the Equality Act, which would amend the Civil Rights Act of 1964 to ban discrimination based on gender identity or sexual orientation. Sanders was also opposed President Clinton’s Don’t Ask Don’t Tell policy, which put gay service members in a kind of limbo. In a 1995 debate, he called out an opponent for saying he didn’t want “homos in the military.” In more recent years, he called on Barack Obama to support marriage equality—something the president did the very next year. In Russell’s book, In Praise of Idleness and Other Essays (1935), contains a chapter, The Case for Socialism. Russell was ferocious on the ills of Capitalism, such as suppressing wages and union rights, or what we now call Income Inequality. More generally, he wrote, “Advocates of capitalism are very apt to appeal to the sacred principles of liberty, which are embodied in one maxim: The fortunate must not be restrained in the exercise of tyranny over the unfortunate.”side with the more advanced civilization could put the land to better use. Bertrand was a known pacifist. He openly protested against world war one. Before war was declared, he had no doubt whatsoever that it was his duty to oppose it. He organized a petition, signed by over 60 Cambridge dons, expressing “their conviction of the supreme importance of preserving England’s neutrality .. considering .. no vital interest of this country is endangered such as would justify our participation in a war.” This appeared in the Guardian and Daily News on 3 August 1914, the day that Sir Edward Grey, the Foreign Secretary, carried the House of Commons in support of a declaration of war, duly made the following day. That day, Russell had the enthusiastic support of the editor of the Liberal paper, the Nation, to publish the following letter, only for an agreement to be withdrawn. After vehement protests, it was printed on 15. Meanwhile is 2003 America was gearing up for a war against Iraq. 20 Democrats in the Senate and one Republican voted against the Use of Military Force against Iraq. In the House, 118 Democrats voted against the invasion of Iraq, including an Independent from Vermont, Bernie Sanders. Russell took a serious interest in the American civil rights movement in the 1960s, writing several influential articles documenting the injustices against blacks and making connections to the united states domestic and foreign violence. As a result of an appeal from an American civil rights group – the emergency civil liberties committee – Russell wrote several statements and letters on behalf of the reverend Ashton Jones, a white civil rights advocate. The appeal was successful and Jones was released in early 1964. While these men didn’t agree on everything. It’s hard to miss such similarities in their beliefs as well as the impact they’ve made on society as a whole. To learn more about Bertrand Russell, read some of his published works.